“There’s a story behind every song” (see AmericanTroubadour.com) … but there’s also a story behind the album. And it’s a good story. In June of 2001, in Stockholm, on Midsummer Day, I got married. Nine months later, Kristina gave birth to our first child. To say that everything changed in my life, in and around that Midsummer of 2001, would be quite an understatement. Amazingly, a song to my beloved actually emerged. Not all at once, but over the next couple of days. Obviously, I had to play this song at our wedding. Just as obviously, there was no way I could manage that. Solution: record it. So I looked in the yellow pages (we still had those back then), or maybe I web-searched too, but in any case, I found a little studio, run by Andreas “Bauer” Bauman. We whipped up a decent recording of that song, which is about my wife’s numerous names (“Anna-Kristina-Kicki-Du,” a song that has not been released publicly). And the DJ at the wedding party surprised her with it, during our first dance. Oh, the look on her face … that’s a beautiful memory. Fast-forward more than ten years, to November 2011. I’ve accumulated a bunch of new songs by then. I’m also a busy consultant, running a couple of international organizations, globetrotting, the usual. But I feel this unquenchable urge to go into the studio and record. I’ll just document these new songs, I say to myself. Guitar, vocals, maybe a little bass — like my first CD album, Testing the Rope (1997). Where to do the recording? A quick web search: Andreas is still there. What’s more, his studio is just five minutes from my house. He remembers me. We’re both a bit more grizzled, we’ve both had a couple of kids … we connect. A few songs into this little documentation project, Andreas starts saying things like, “riktigt bra” and “klockrent” (which means he thought the songs were really good). He says they are too good to leave on the shelf. He starts gently suggesting some additional musicians. It’s clear he’s not fishing for extra work; he’s offering to do this without pay, because he likes the music. And he starts pulling in some amazing people. I’m clueless about what’s happening. “I’ll see if Ronander can play on this,” he says (about “Entebbe Blues”). “Uh, who’s that?” I say. Mats Ronander is, of course, a household name in Sweden; he once toured with Abba. As the project grows, I start pulling in folks too. Turns out some of my neighbors are excellent musicians — a female vocal trio, an old-time fiddle-player, an opera singer. Even the graphics are a labor of love. Andreas’s wife introduces us to one of Stockholm’s hottest PR and graphics bureaus. 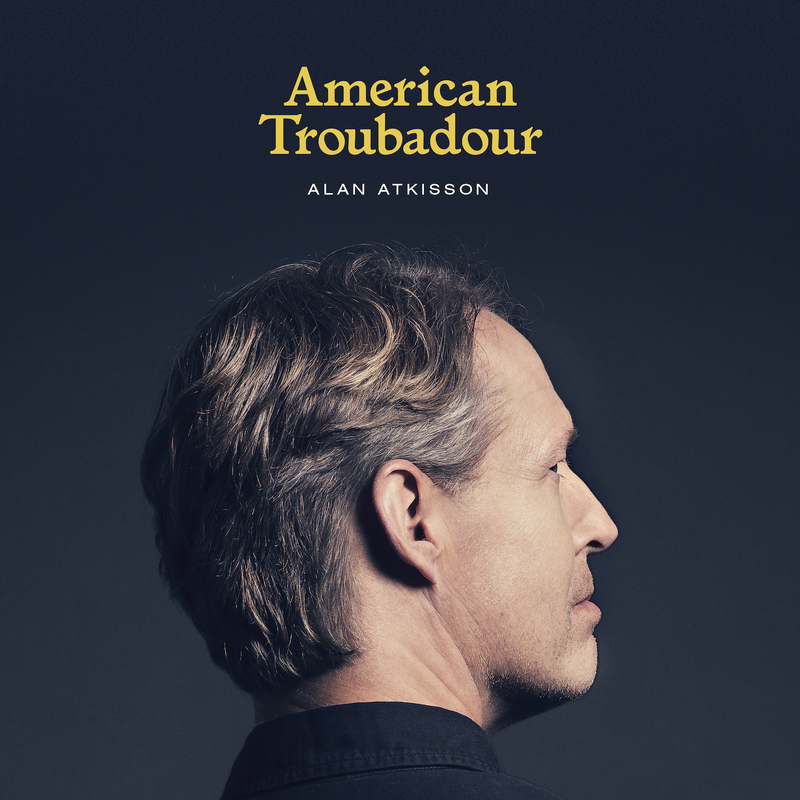 They take time from their busy corporate practice to work on “American Troubadour,” at rates far less than they would normally charge … because they think the project is cool. They (Christian Hammar and Björn Lundevall of FLB Europa) like the whole American-Swedish thing, and they work far harder on it than I have any right to expect. They even come up with a great new symbol for … well, for me. My music. My travel-influenced perspective on the world. My dual-citizen life, which has been so deeply enriched by the marriage that starts this story (listen to “Midsummer Island”). Which has helped to sustain me … in my work to sustain others … who are working on sustainability (listen to “Set the World Right Again,” and “Going to the Top”). What a journey “American Troubadour” has been. So unexpected. So fun, and musically satisfying. It’s so wonderful that it’s finally out there, finally finished. And yet, I have the feeling it’s just another beginning.